Setting up your own studio is one of the greatest joys you can have as a potter. 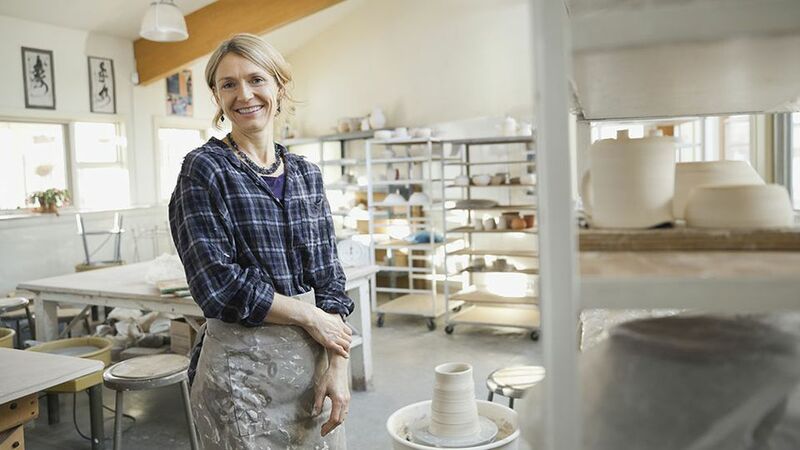 Your own space to learn, work, create your ceramics and really push the boundaries of your creativity. It can also be a tough process with quite a lot of decisions to make. First you’ll need to decide on a space, and quite possibly that could be the hardest part. How close is it to your home? Does it have great ventilation? Heat, toxic fumes and dust can be detrimental for your health, so making sure there is plenty of fresh air to circulate your studio is key. Your kiln will also need a good amount of space around so the air can leave the bungholes. Two essential things you’ll need to get started are electricity and water. Your new studio must have a decent supply of running water, and in terms of electricity you’ll need to ensure there are enough plug sockets for all of your equipment and for lighting. Before buying your kiln or renting your studio (whichever comes first), you’ll need to look up the power supply of the kiln if it’s a three-phase amp ("a common method of alternating current, electric power generation, transmission and distribution"). If your studio can only take a single-phase amp (through a normal power socket), then you’ll have to get an electrician to increase the power supply, so it is able to cope with a three-phase kiln. The first thing you need to do is assess your space and resources. What kind or size of equipment should you be looking for? How much can you afford to spend? It can be really tempting when you first get your own studio to want to buy all your new equipment at once, but you really need to assess what is necessary. Look at your potting. what inspires you and what you need. Do you like the idea of a wheel but really are a hand builder at heart? Then hold off on wheel buying and really focus on your niche as a potter. Do you find hand rolling your clay time consuming and strenuous? Then perhaps a slab roller could be a good investment for you. In terms of the clay you use, do you buy it ready bagged or do you make your own? If you make your own, then a pugmill (a pugmill is defined as "a machine in which materials, as clay and water, are mixed, blended or kneaded into a desired consistency") could be your best bet. Then, of course, there’s your tools… work out your essential tool kit and go from there. Our basic tool kit checklist would include: a wooden and a plastic rib, a wire tool for cutting clay, several sponges, a wooden knife, a ruler, some callipers, a turntable (or banding wheel) and plenty of paint brushes for glazing or tongs if you prefer to dip glaze. There are several determining factors for how to determine your space. Look at where your plug sockets are and how many you’ll need. There are several different areas you’ll need to mark out: a hand building area with a large work bench, a glaze area (this should be close to a window for extra ventilation), a space for your wheel, an area with at least a meter space around for your kiln, a drying area, a sink and an area to store your clay. If space is a luxury then you could make an area to store damp pieces of clay, which you are still working into. If you can lay out your studio in the most efficient way possible, you’ll really be ahead of the game. Think about the process of the clay, how you’ll use it and then mark those areas accordingly. For example, put your clay store near the door, next set out your workbench, etc. Think of the flow of the way your work and create your ceramics, and make sure your studio reflects this. Make sure your throwing or hand building area is right next to your drying area. Greenware in its raw state before being fired, through any stage of the drying process, is at its most fragile, so you’ll need to make sure you don’t need to move it far to dry properly, to reduce any chance of it being cracked.